A snowstorm that closed schools and halted traffic across North Texas is being blamed for 13 cars and two tractor-trailers sliding off U.S. Highway 75 in Melissa, north of Dallas, Friday morning. 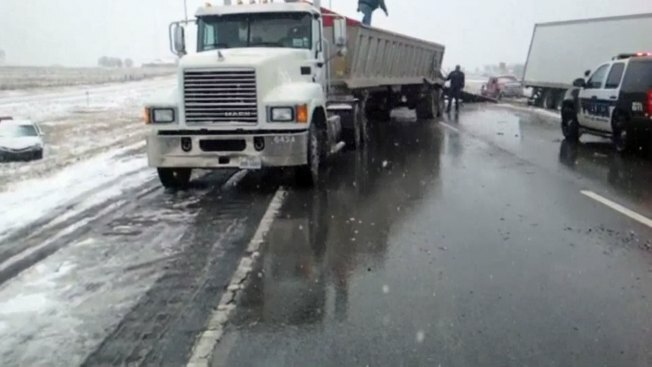 As many as 40 vehicles were initially reported to have slipped off the slick highway, some of them crashing into each other, between Melissa and Throckmorton roads. At about 1 p.m., two hours after the crashes were reported, NBC 5 confirmed with officials that only 13 cars and two tractor-trailers were involved. "We had one or two vehicles involved in a crash, then we had several vehicles trying to avoid that accident, those went off the road," DPS Sgt. Lonny Haschel said. "The majority of them are not going to be car crashes, vehicles that just simply slid off the road and need a wrecker." Initial reports from The Texas Department of Transportation said no injuries were reported, but NBC 5 has learned two people were hospitalized for minor injuries. Collin County officials told NBC 5 that the crashes were caused by separate collisions where drivers lost control of their vehicles and not one large pileup. NBC 5 viewer Dennis Day told NBC 5 he saw at least one car that had been struck multiple times. Roads were expected to remain treacherous well into Saturday. The snow and ice left many drivers frozen in place on Friday near the Fort Worth mixmaster. Problems plagued highways in Fort Worth as snow and ice was the main culprit. In Fort Worth, officials closed the Interstate 30 and Interstate 35W Mixmaster due to road conditions. Several inches of snow began falling in North Texas after 8 a.m. Friday. The winter weather has covered roadways, making driving treacherous. Drivers are urged to use extreme caution. At 11:00 a.m. Friday, I-30 was covered with a layer of snow. One SUV spun out of control and sat stranded in the middle of the highway. A person got out and unsuccessfully tried to push the car. By 4:00 p.m., overpasses became nearly impassable at the mix master. Two tractor trailers became stuck trying to go up an incline on the I30/I35 exchange. Emergency crews had to tow the trucks over the ice. At 8:00 p.m. I-30 still had a layer of snow that covered parts of the highway. People continued to drive cautiously as night fell. Many cars were left stranded on the side of the road after a busy day for emergency crews. Fort Worth police responded to well over 200 accidents throughout the day. The Fort Worth Police Department reported as of 7:30 p.m. officers had worked 160 minor accidents, 57 major accidents and took 25 hit and run reports since midnight. Heavy snow in Denton caused wrecks and traffic delays Friday. In Denton, many drivers were stranded for hours. Some even gave up, turned around and headed the wrong way on entrance ramps. Several semi-trucks were stuck on I-35E since rush hour trying to get through slick spots. Good Samaritans towed some of those semis with their Jeeps and 4x4s. "This guy is loaded with about 80,000 lbs so we're having problems, his airbrakes had locked up on his trailer, so we're struggling to get him out now, but we'll get him out," said Dustin Hall with Texas Anytime Recovery. Hall's group helped for free. Snow and ice covered Interstate 20 at Highway 360 in Arlington Friday, leaving drivers stuck for hours. In Arlington, snow and ice covered I-20 at S.H. 360 leaving drivers stuck for hours. Ice also caused trouble for drivers making their way from the S.H. 360 rank to I-20 east toward Dallas. A big rig got stuck causing problems for drivers behind him and tieing up traffic for some time. The Arlington Police Department said between the hours of midnight and 7:45 p.m. the city had seen 34 minor accidents, 33 major accidents and 115 calls for assistance. Many school districts announced early release and closures Friday, including some who have suspended bus service. Get the latest on school closings and delays here.